"That Lark doesn't Just hang but sounds like he belongs is no small feat. 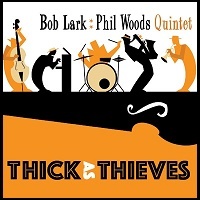 His rich tone and lithe phrasing are a great fit for Woods' relaxed swing." his flugelhorn and muted trumpet." consistently high level of creativity and execution." seduce. That it does and does well." changes and some of Reid's best comping under McNelly's piano." "Nailing it throughout, this is real brass with real brass." recorded "live" at Chicago's Jazz Showcase. McNeely (piano); Steve Gilmore (bass); Bill Goodwin (drums). performing together for one last time on this CD."